I know I've been a little quiet lately but it's the busy time of year for me with weddings and gift baskets but you won't get any complaints from me! 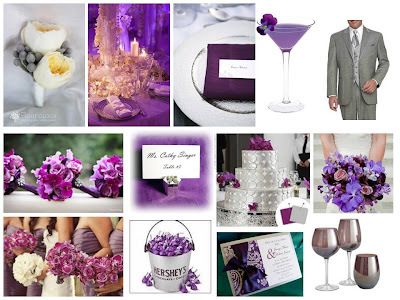 I have two brides coming up with the exact same color palette of eggplant and silver but one is not sure what to do with it. I put together an inspiration board based on her want of a silver cake, purple and silver candy buffet, purple signature drink, purple stemware, eggplant dresses for her bridesmaids, grey tuxedos for the groomsmen, and a white bout for the guys. I think it has everything she'll want and since we as wedding professionals tend to see the overall big picture, I'm sure she'll love the end results!